Welcome to the espclock wiki! This clock uses the GPIO pins on the ESP8266-01 module to connect to 2 Adafruit 7 segment display backpacks. A momentary ON switch is also used to put the clock into program mode. 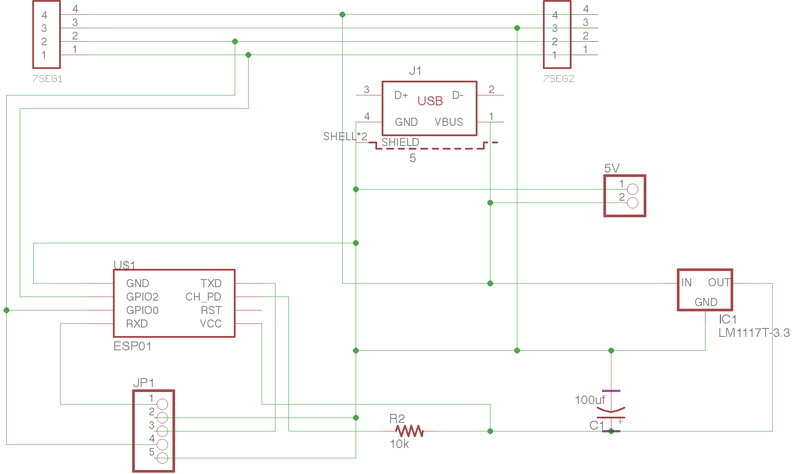 A basic schematic includes a 3.3v regulator, the ESP8266, the two displays and the button. The clock can use a 5v input such as a USB charger. Special Thanks to: Ben Buxton for his original design and code. Paul Stoffregen for his Time Library. Ewald Kendziorra - www.kendziorra.nl for his NTP code that actually gives milliseconds! Dr. William F. Baker for his inspiration for a high precision time piece.